I have a penchant for pencils. 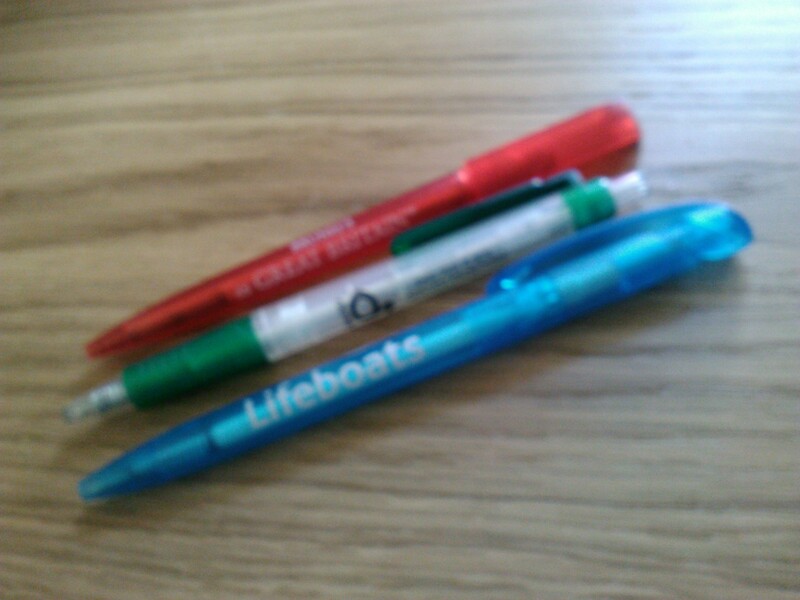 And biros and felt tips and roller balls. Whenever we visit a museum or other tourist attraction, the first thing I check out in the gift shop is their range of pens. To me there is no finer souvenir of an enjoyable family day out than a pen with the name of the venue on it. Provided, of course, that the shop’s stock matches my high standards. The perfect souvenir pen must write a fine line in blue or black ink, have a durable casing in a tasteful colour, and sit comfortably in my hand. It must have a slogan or logo that I’m not ashamed to be seen with, although in a moment of weakness I can be persuaded to invest in one of those with a small perspex chamber, filled with liquid, in which something moves up and down – a boat afloat on a river, perhaps, or a soldier on parade outside a palace. I have been known to seek out a National Trust shop specifically to buy one of their Biros. Anything rather than use the cheap, scratchy pens that Gordon, my husband, picks up free from the bank, or worse still, an Argos midget. The cheering power of the pen is not limited to those from famous places. 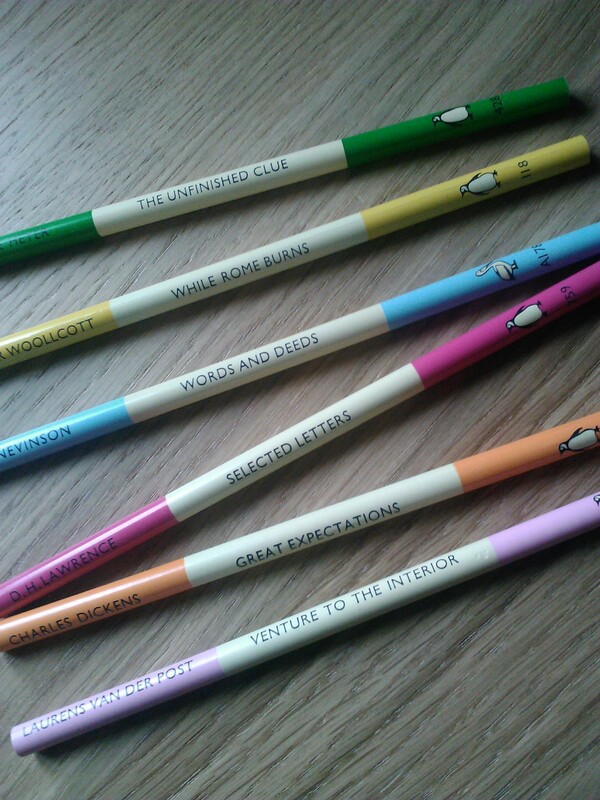 Lately I’ve been particularly fortified by a beautiful set of Penguin branded pencils that I won in a raffle. I love classic, simple branding, and Penguin fits that bill (or should that be beak?) 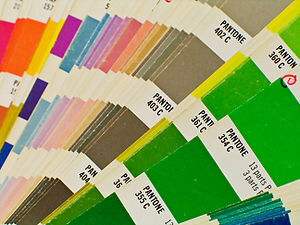 Each is in a different, mouthwatering colour and bears the title of a great book in an elegant, spare typeface. 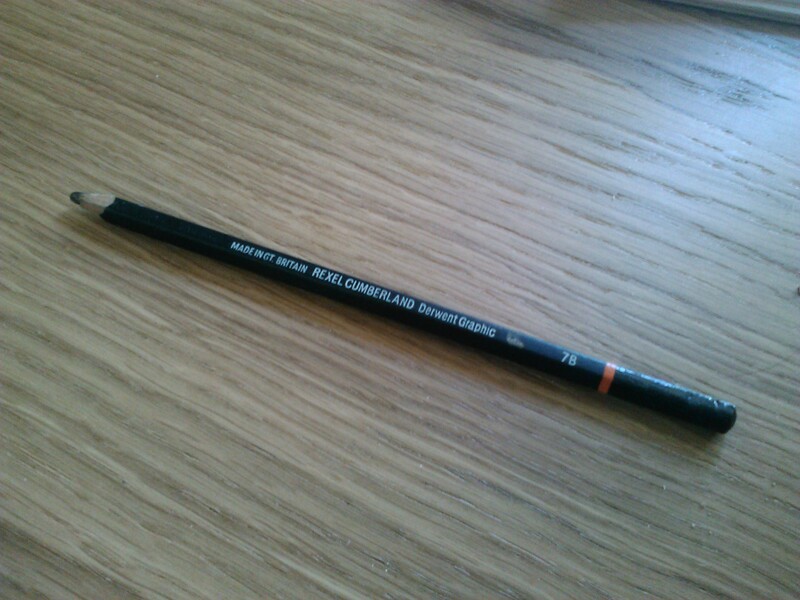 But today an unbranded pencil stops me in my tracks. I pick it up at random from one of the many pencil pots that populates our desk-heavy house (five desks for three people), to scribble an addition to my Ocado shopping list. It makes an annoyingly thick line on my tiny square of paper; it’s like writing with molten lead. 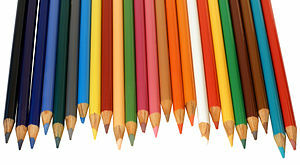 (And yes, before anyone points it out, I do know they put graphite, not lead, in pencils these days.) I stare accusingly at its shaft, wondering where it has come from. And then, for a second, my heart stops. For it’s an artist’s 7B, bought by my first husband John. John died twelve years ago, ten days into the new millennium – but here his pencil remains. Who’d have thought it? To be outlived by a throw-away item that cost him less than a pound. John’s addiction to graphic designer’s accoutrements was as entrenched as my own to the writer’s tools. His desk was littered with Rotring pens that had to be used at a precise 90 degree angle to make the ink flow properly; crispy,ancient half-used sheets of Letraset; chilly metal rulers, used with a Stanley to cut a perfect line in a piece of paper. (Oh, how he’d have loved the new Pantone Hotel that was recently featured in the Independent’s Traveller supplement!) Here was a man who really appreciated the precise gradations of Hs and Bs in pencils. He always found the commonplace HB an unsatisfactory, sad compromise: it was neither one thing nor another. I resist the urge to take my revenge on the poor pencil by sharpening it away to nothing in my battery-powered pencil sharpener. (Who doesn’t love those?) And then I realise with a start that as my need to write anything in 7B is very rare, this wretched pencil will probably outlast me too. I cast it aside and grab from my handbag one of my faithful museum biros. Ah, the one from the SS Discovery! Now that was a lovely day out. I resume my shopping list, a little calmer now. But deep down, I’m wishing that Ocado could deliver an elixir of eternal life. It’s not just the pen that can be mightier than the sword. Debbie, my favourite pencil is the 2B. 2B or not 2B, that is the question. (Sorry, couldn’t resist — I have poor impulse control at this time of year.) HB feels too hard and scratchy to me; I love to feel the texture of the page through the pencil. I also have a set of Rotring pens somewhere, sadly forgotten and neglected, with ink all dried in the nibs. AND I loved Letraset. My Dad introduced me to all of these (he was a civil engineer with an artistic bent), and they have memories connected with him. Sounds like he and John would have enjoyed a chat. I love John Steinbeck’s Journal of a Novel where he obsesses over getting exactly the right pencil. 2B was the one he used, and nothing else would do. Personally I’m of like mind – I prefer a pencil to a pen. Somehow it’s more tactile. Unfortunately it still doesn’t mean I can read my own writing a day later. I’ve always been kind of fascinated by the high regard other people hold for certain kinds of pens and pencils. It’s completely lost on me, unfortunately, although I do recognize when I like a pen and when I don’t. That’s about as deep as it gets. Being left-handed doesn’t help. I’m often mad at my writing instrument for smearing as I move across the page. That said, those Penguin pencils are totally cool. I may even slightly covet them. I love this post, both for its tribute to your late husband and the sweet simplicity of the story. Thank you, Laura. I am hooked on all things to do with Penguin Books – so imagine my dismay when it was announced this week that the company is to merge with Random House. All kinds of rumours and suggestions as to the new corporate id – I was rather hoping for Random Penguin or Penguin House, but they’ve gone for Penguin Random House. Boring. Right, hey? Or even Random Penguin House. Sheesh, they copped out on that one. Like the post, especially the bit about souvenir pencils. When my daughter was yung we bought a pencil from every museum, zoo, art gallery or other attraction we visited. I have dozenss of them, but can’t bring myself to use them! Thanks, Lindsay! I must admit to buying more than one museum pen when I find a particularly nice one, so that I’ve got “swaps”! And pens and pencils are always so much nicer than all that cheap plastic tat that you seem to find in most museum shops these days! Liked your pencil bit… pencil bit? Better rephrase that! Was always getting in trouble at school for chewing the end of my pencil. Was their concern about my poisoning or ruining school supplies? I suspect the latter. And then those so-called indelible versions, yuk! That sure cured me. For one thing you could never get away with saying . ‘I never!’ The evidence was plain to see. The local bookie’s runner was indelibly marked and obviously past the kissing stage (although he had seven kids! ), his lips and tongue as purple as – as… oh, what’s that dog with the purple tongue? Could have caught on with the girls during war time if they had only produced it in a less sluttish shade! Imagine, lippy that never wore off. Why do they make it edible?Probably it was invented but the major lipstick manufacturers formed a cartel, hmm? Like the Big Seven petroleum companies who allegedly bought off the guy who invented a pill you only had to add water to, to make fuel. Better stop, this is getting silly! Thank you, Shaun, for your comments and for making me laugh! Who’d have thought the humble pencil could be so interesting? !